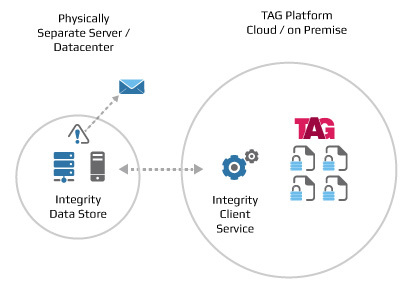 To enhance an organisations ability to actively monitor information security within TAG we have developed a complimentary software service called ‘Integrity’. Integrity provides live monitoring of published TAG content with email alerts where unexpected file or database changes are detected. Continuous file and database checking ensures peace of mind and reliability. Email alerts provide timely notification about unexpected changes. Integrity examines and records a unique fingerprint of all TAG files and database records at the time of publication. Then, on a daily basis Integrity re-checks the same data against the recorded fingerprint. Integrity can detect unexpected editing, creation or deletion of a file or database record. If any changes are found, selected individuals can receive alert emails. Authorised administrators may accidentally or maliciously make changes to files or database records by tampering with systems directly. Typically it is not possible to detect database or file tampering until audit records are examined after the fact. Changes may go undetected for some time and if the system is GxP compliant there may be deep running repercussions. Integrity bridges this gap by checking for changes on a daily basis meaning the organisation is made aware far earlier and can take affirmative action. Integrity Data Store is designed to be installed and run independently either by a client, or a third party provider. Separately hosted monitoring can be utilised for either TAG Cloud or on premise delivery. By entirely separating both the infrastructure and administrators access to those systems it makes it virtually impossible to tamper with a record and not be detected.